2014 has been quite a year for anime and 2015 is looking to be another great year as well. Celebrating the New Year festivities, many anime studios and artists are producing anime artworks to welcome the new year and tease what they have to offer for 2015, and boy there are a lot of them. 2015 is also the year of the Sheep in the Chinese Lunar Calendar, so expect some characters dressed up as sheep for the occasion. This is an anime Happy New Year to welcome 2015, so lets see what creative amazing anime artworks have been produced for the New Year. 2015 will be a very special year for A-1 Pictures as it will be the 10th anniversary for the studio on May 9th. The studio posted a storyboard of the actual studio’s exterior, with some liberties, and of course thank all their fans as the studio continues to stride into the future. Kyoto Animation have uploaded the New Year image to their website featuring a drawing of Mirai Kuriyama from Kyoukai no Kanata, teasing about the upcoming Kyoukai no Kanata films, and Haruka Nanase from Free! : Eternal Summer. Production I.G. has had a modest year in 2014 producing few but well received anime. Their announced works for 2015 so far includes the Psycho-Pass film, second season of Haikyuu!, and the anime film adaptation of Miss Hokusai. The studio’s site itself has greeted the New Year with a still from the movie. Studio Shaft has had quite the year in 2014 and ended it on a very high note with the broadcast of Tsukumonogatari on New Years Eve. The studio’s website has an image for their upcoming adaptation of Koufuku Graffiti, which is airing from the 8th. Studio Ghibli has had a rough 2014 with legendary director Hayao Miyazaki stepping down from directing animated films, and the studio having a massive internal restructure following his departure. But nonetheless the studio welcomes the New Year and thanks all their fans for their continued support and hope they look forward to what they have installed for 2015. Sunrise studios are celebrating the new year on their site with two new images; the first image (above) is the announcement of the Blu-ray releases of two of Sunrise’s oldest series, Madou King Granzort and Doraemon. The second image features characters and logos from the 2014 anime that the studio has produced and includes: Fumina Hoshino (left), Sekai Kamiki (center) and Yuuma Kousaka (right) from Gundam Build Fighters Try – with the Gundams Gunplas, Ichigo Hoshimiya (center left) from Aikatsu!, Honoka Kousaka (bottom left) from the second season of Love Live! School Idol Project, and Kanon Otosaki (center right) and Haneru Tobitatsu (bottom right) from Tribe Cool Crew. Manga Artist Namori has illustrated a New Year’s image featuring his most popular series, Yuru Yuri, and its spin-off Oomuro-ke. The image itself features the Oomuro family; Sakurako, Hanako and Nadeshiko, all trying to make some Mochi. Apparently there isn’t enough Yuru Yuri for New Years so the official website of the Yuru Yuri anime has released a small sketch for the New Year featuring Ayano Sugiura. The image itself was given out to visitors who went to the special screening of Yuru Yuri Nachuyachumi! OVA on the 1st as a limited quantity of greeting cards. The official website of the upcoming Assassination Classroom anime has released their own version of a celebratory New Year with the alien Koro-sensei in an odd getup. The anime itself will air from January 9 at 25:20 JST (Jan 10 1:20am JST). The official website of the Juuou Mujin no Fafnir anime has released a special yukata themed 1080p wallpaper featuring Iris Freyja to welcome the new year. If you are on a mobile device the site also has different sizes for each possible device, so start your new year with some Iris. The official Twitter for the Diabolik Lovers anime adaptation have released two new images to celebrate the New Year. The shoujo series has a new visual novel releasing in February this year for the Vita, though unfortunately there has been no information about any additional anime based on the games. Junichiro Taniguchi, the anime character designer of the Gekkan Shoujo Nozaki-kun anime, has released a special New Years illustration of Chiyo Sakura on his Twitter account. And of course the oblivious Umetarou Nozaki is the sheep. 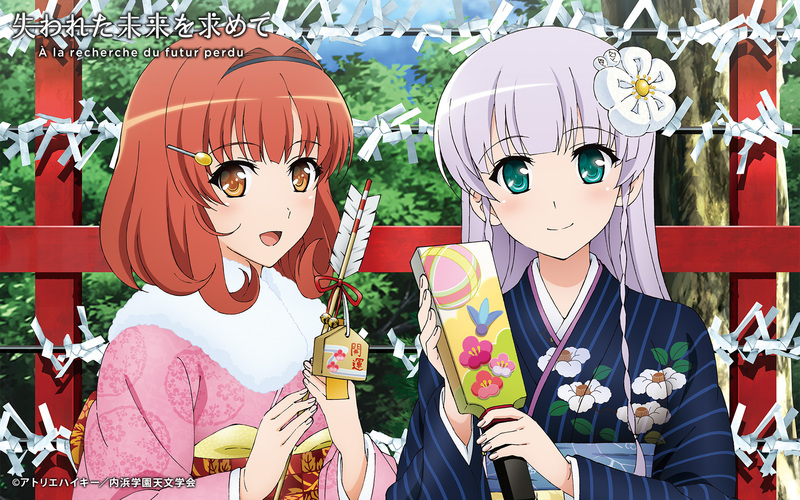 Taking a break from all the space ship fighting and science fiction drama, the official website of the anime has released two yukata themed images welcoming the New Year. The first image (above) features Susumu Kodai and Yuki Mori together and the second image (below) has Kaoru Niimi in her blue yukata. Instead of travelling around the region the Akatsuki no Yona anime website has released this new image with Hak Son and Yona from the anime dabble in some traditional New Year celebrations. Wonder what kind of luck she will get. A brand new year and a brand new High School DxD anime is coming. The official website of the anime has released their festive image featuring all the main girls in their special yukatas, though most of them don’t seem to fit, and preparing for the third season of the anime. What a better start to the year than some yuri. Unfortunately this image from the official Twitter of Sakura Trick lacks some affectionate love, but this cute image of Yuu Sonoda welcoming the new year is still a sight that can melt hearts. It’s a brand new year and Yuriko Ishii, the anime character designer and chief animation director of Nagi no Asukara, has revealed a new illustration of the anime’s Twitter. The image features Chisaki Hiradaira and Tsumugu Kihara as they decide what to do for the New Year festivities. 2015 is going to be a big year for Wake Up, Girls! since it has the new sequel anime film releasing later in the year. The Twitter of the anime has released a new image featuring Yoshino Nanase visiting her local shrine in the anime’s first episode, which is quite topical. The official website of the Ushinawareta Mirai wo Motomete anime adaptation has released a wallpaper image to celebrate the New Year, with all sizes for PC and mobile devices. The special wallpaper itself will only be available till the 5th. Additionally, the next Blu-ray volume of the anime will release on the 28th. The official Twitter for the upcoming Death Parade anime has released a small message wishing everyone a Happy New Year and that the anime itself will be airing this month on the 9th. The Twitter account of the Ookami Shoujo to Kuro Ouji anime has welcomed the new year and also thanked fans for a wonderful 2014, which according to them was the year of Ookami Shoujo to Kuro Ouji. 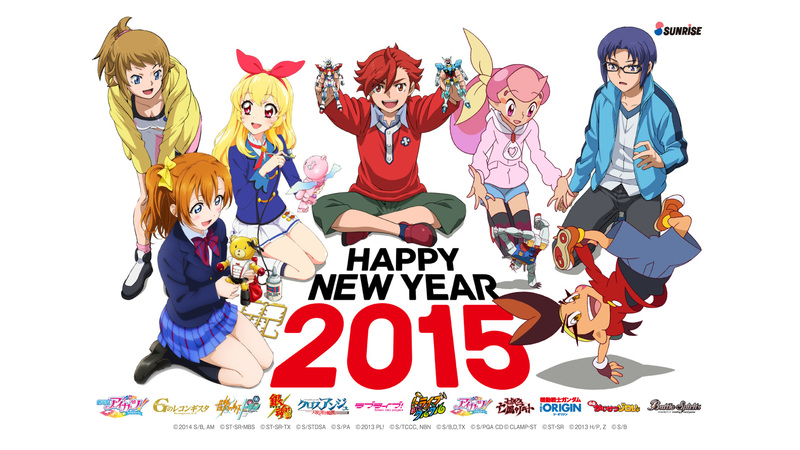 2015 is going to be the year of Pri Para with a second season and a new anime movie coming out soon. Both will also include appearances from the girls from Pretty Rhythm so you bet it will be a very happy sounding experience. The official Twitter account of the series has released a new image to celebrate the New Year and the upcoming series. For a series about climbing mountains to experience wonders of nature, the official Twitter account for Yama no Susume accurately celebrates and welcome 2015 in the best way possible, watching the first sunrise. The Twitter also released a small visual of the anime’s second season to celebrate the occasion. 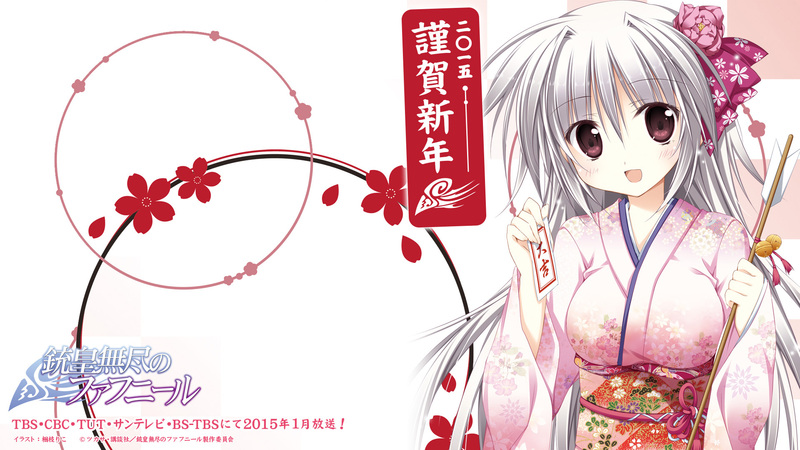 The Twitter of the Trinity Seven anime has released its 2015 image featuring Lilith Asami in a red yukata. The image also reminds fans about the upcoming Blu-ray releases of the anime. There has been two magnificent New Year art pieces released on Twitter for the Kiniro Mosaic anime, the first (above) done by Kazuyuki Ueda the character designer of the Kiniro Mosaic anime and the second (below) is from the anime’s official Twitter, which also gets everyone in the mood for the series’ second season. Was 2014 moe enough for you? It should be since Gochuumon wa Usagi Desu ka? aired in 2014. 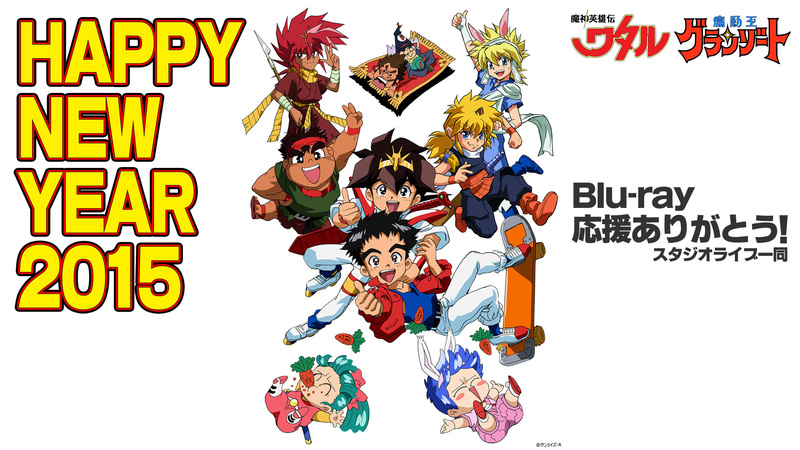 The anime’s Twitter has released their image to celebrate 2015 along with a humble message thanking all the wonderful fans. Also a rebroadcast of the anime will begin on the 5th, if you want more delicious hot cocoa. The official Twitter for the Shokugeki no Souma manga has released their welcoming image for the new year, drawn by Shun Saeki, thanking everyone for making the series possible in 2014. An anime adaptation of the series will air this year. The official website of the Mikagura Gakuen Kumikyoku anime have uploaded a new visual that celebrates the New Year. The visual features Himi Yasaka from the calligraphy club drawing a big Happy New Year. The anime itself will be airing later this year. Masahiro Anbe, the creator of the Shinryaku! Ika Musume manga, has went on Twitter to reveal that the world’s most lovable squid girl is now a sheep. I think. Regardless, we love Ika no matter what she wears as she is always adorable and welcomes the New Year by trying to escape the sheep pen- hey she’s getting away! Takuya Fujima, the illustrator of the Magical Girl Lyrical Nanoha ViVid manga, has went on Twitter and his blog and released this colourful image of Vivio Takamachi (right), Fate Testarossa (left), and Nanoha Takamachi (center) in their yukata and eating delicious mochi. I want some mochi now. 2014 was a big year for the artist as it was when the series was announced to be receiving an anime adaptation, which will be airing later this year. The official Twitter of the Koufuku Graffiti anime have released series creator Makoto Kawai’s own image and greeting for 2015 with Ryou Machiko munching on some delicious mochi, whilst also sitting on giant mochi. The anime itself will be airing this month from the 8th. Fairy Tail creator Hiro Mashima has got two amazing images on Twitter that welcome the new year of 2015. The first (above) features Happy dressed up as a pink ram and the second (below) features the actual sheep zodiac spirit from the series, Aries. Tetsuya Ishikawa, the character designer of the Saikyou Ginga Ultimate Zero: Battle Spirits anime, has produced this colourful piece for the 2015 New Year, featuring Ichibanboshi no Rei and Raira April in traditional yukata clothing. Masayoshi Tanaka has released this super cute image of Meiko Honma from AnoHana dressed as a fluffy sheep. Whilst the anime itself is over, Tanaka and the AnoHana team will actually be working on a brand new top secret project that will be revealed this year. Ume Aoki is celebrating the new year on Twitter with a special, and quick, sketch of Yuno from Hidamari Sketch yelling 2015, as well as showing us the year on her hands. While most people try to have the most traditional New Years possible by attending shrines, you can’t dismiss staying inside with your friends and family whilst watching the special programs at home. Norio Sakurai has showed us (above) that very situation on Twitter with his sketch on the main characters from her Mitsudomoe manga. She also has another image (below) about possibly doing a one-shot series later this year. With an anime adaptation on the way this year the official Twitter account for Yamada-kun to 7-nin no Majo‘s manga creator Miki Yoshikawa has released her New Year celebration for 2015. The image itself features Urara Shiraishi (back left) in a blank state over Ryuu Yamada (front left) and Toranosuke Miyamura’s (front right) usual antics. Oh and Saeko Fukazawa (back right) is also here to welcome 2015. This isn’t really a series most people know and just started in 2014, but the μ & i manga by Ryouma Kitada has some adorable art, especially with this 2015 greeting he posted on his Twitter. And who knows, maybe 2015 is when the series becomes well known. Akira Sugito has produced his own greeting on Twitter for 2015 featuring Mizuki Suzushiro from his Boku Girl manga in a themed sheep costume. Aside from the humble comments thanking the fans, he wishes that he will continue to draw fun illustrations this year. And that is quite a large list of many anime creators and producers celebrating the new year. I’m sure there are many that we missed. Which is your favourite? And what are you looking forward to in 2015?